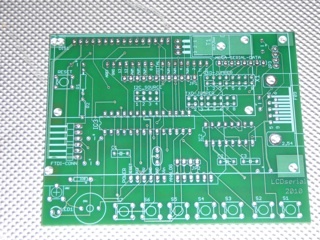 This Arduino board is designed to be primarily a standalone serial LCD display. 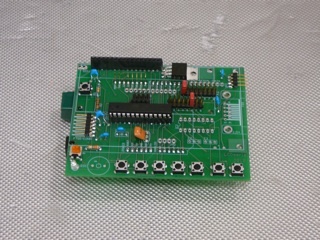 It can also be used as a primary display on any arduino, regular or mega. It was desgined because of the lack of an LCD display board that supported proper ASCII (i.e. cr/lf) and was open source. 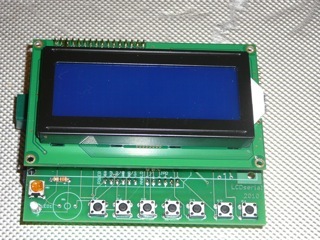 This board allows you to have a 2 line or 4 line LCD display WITHOUT using any extra Arduino pins. It just uses the TXData that normally goes to the USB port. Thus allowing you to use the same serial print functions that you would to the Arduino serial monitor. It also means you do not need to include the LCD drivers in your program and saves you valuable space. Includes 7 on board buttons for use with your program. These buttons send ASCII "1" through "7" when pressed to the selected transmit line. The transmit line and receive line can be set independently. In order to program the Arduino CPU on the LCDshield you need an FTDI USB cable or equivalent. You must set both TXD and RXD jumpers to position 6 (FTDI). 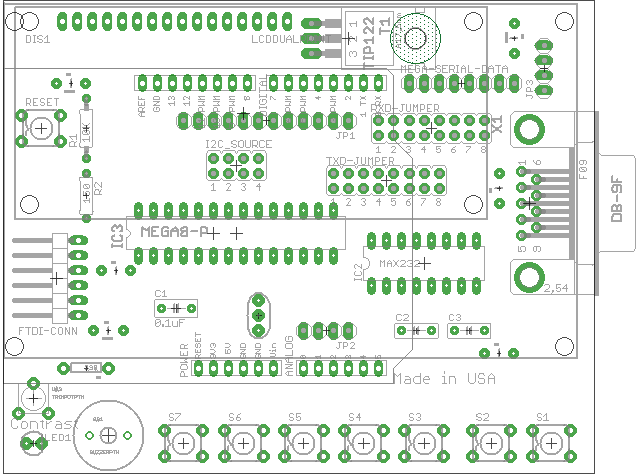 Once this is done, the LCDsheild should be have just like an Arduino Duemilanove with either the 168 or 328 CPU. The LCD shield can use the standard LiquidCrystal library. If you don't have an FTDI cable, you can put the ATMEGA cpu in an Arduino board, program it, and then put it back in the LCDshield. This of course is fairly inconvient but it works.